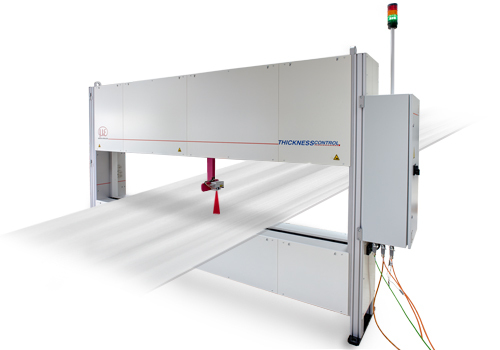 In strip systems such as longitudinal and cut-to-length slitting shears, the advantages of C-frame and O-frame shaped measurement systems of the thicknessCONTROL 820x and 920x series become particularly clear. The high lateral resolution of discrete laser lines enables both thickness measurement and width detection. Also in grinding and milling lines, these systems offer high precision measurements on highly polished surfaces. The O-frame system is installed into the line after the mill. The system measures the thickness profile by traversing. A fieldbus interface transmits the data to the mill for feedback control purposes. The MTS 8201.LLT is equipped with laser triangulation scanners which means measurements are unaffected by the surface properties of the target material. Scaling or mirror effects of the metal surface are therefore absorbed. Furthermore, compared to point sensors, the system offers higher accuracy and a larger mouth width. The O-frame shaped mechanical system provides a temperature-compensated frame that compensates for any thermal changes of the measurement frame using additional sensor technology. The measurement line is arranged vertically to the material flow, enabling the system to cope with any lateral strip tilting.